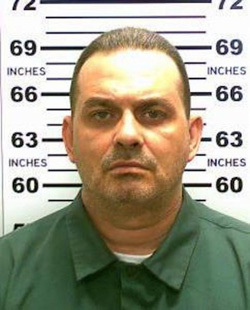 Richard Matt, one of two men who escaped from a New York prison on June 6. Richard Matt, 48, and David Sweat, 34, tunneled out of Clinton Correctional Facility in Dannemora, New York on June 6. Since then, stories about Matt make him sound like a complete psychopath. An accomplice who watched him break a man’s neck in 1997 called him a “master manipulator.” He may have conned a female prison employee into helping him. Escaped murderer in New York called cunning and evil, on CNN.com. Escaped killer Richard Matt freaked out his own family, on TheDailyBeast.com. Female worker probed as possible accomplice in prison break, on NYPost.com. Escaped murderer Richard Matt could seek revenge, accomplice says, on NBCNews.com. Female prison employee gave escaped murderers ‘equipment or tools,‘ D.A. says, on People.com. Joyce Mitchell had sexual relationships with both escaped N.Y. inmates, sources say, on NYDailyNews.com. This is such a tragedy. Unfortunately, we all know how it can happen. Glad you posted this Donna. I was just thinking yesterday while watching this news coverage how quickly a sociopaths/psychopath can worm his way into a victims life and destroy ever aspect of the victims life for their own gratification. It’s clear that she is a victim of a psychopath’s masterful manipulation & mind games. Sad she will most likely go to jail for her actions but the reality is she & her co workers are not educated fully on how they can be sucked into a psychopaths con game so quickly. I am sure she is absolutely stunned & confused at how she allowed herself to get sucked up into this con artist plot to escape jail…we all know exactly how it happened = pity play, smear campaign, brain washing, mind control, gas lighting etc. Another psychopath strikes with love bombing!! “A female prison worker being questioned by police over her role in the extraordinary escape of two convicted killers from a maximum security prison has said one of them ‘made her feel special’ and she ‘thought it was love’, according to reports. Joyce Mitchell, a 51-year-old grandmother and an industrial training supervisor of Clinton Correctional Facility in Dannemora, New York, reportedly planned to be the getaway driver for Richard Matt, 48, and David Sweat, 34, but got cold feet at the last minute. In the end, Mitchell, checked herself into a hospital for nerves on Saturday, the day the inmates were discovered missing from their cells, having drilled holes in the cement walls with power tools they obtained. The older inmate, convicted killer Richard Matt, 48, who has a history of escape attempts, had wooed Mitchell for months and established a relationship in which she agreed to drive the getaway car. I feel so bad for this woman. She wanted love and she got played. She will be held accountable and pay the consequences for getting swindled. And yet, she probably saved her own life by checking in to the hospital for anxiety rather than being the driver. I am sure she would have provided the service and then would be murdered. Now she has a chance to pay the price, and make something of what’s left of her life. That’s more than a lot of victims of a psychopath get. What I have read about the escaped prisoners – psychopaths. Scary. The woman has learned a hard lesson about psychopaths (like we all have). Thankfully, she didn’t drive the getaway car and is ALIVE. She might serve some time in the prison, but she can recover. I just hope that the escaped prisoners are caught ASAP and do NOT harm any innocent people (while they’re on the run). This morning I heard on the news that she arranged this in exchange for them killing her husband – but backed out because she decided she loved her husband after all. If true, the whole story is not so clear-cut. When I first heard about this, I wondered if hybristophilia might have been a factor in her involvement with them. But now, hearing about the murder of her husband as a motivator, that seems less likely in favour of the same-old, same-old reasons for murder and mayhem and criminal conspiracy generally. Annie, I think you have to keep an open mind with regards to this woman. Remember she was manipulated by a very masterful manipulative psychopath…he killed someone then cut them all up to dispose of the body this is why he was in jail. These men were truly sick in the mind. Also remember psychopaths can brain washing, mind control and use trance & hypnosis on their victims without their victims even knowing. So for me she is a victim of these two evil men and her employer ( the prison) did NOT protect her from these evil man what so ever. The prison should have some type of safely net each week to make sure their guards are not being conned and brain washed. Psychopaths are cult leaders of the world!!! Even if they only have one victim or a million victims they use the same exact mind games & techniques such as gas lighting abuse, reward & punishment etc to control their victims…and just like a cult follower a victim of this type of abuse needs help to escape their mind control & brain washing. I don’t think she would ever want her husband killed I think this was brain washing done by these two man to initiate their escape. Basically they screwed with her mind until she did not know what were here own thoughts.